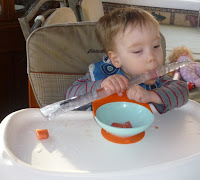 There may be some people out there that think that holding an icicle may not be too much fun...however, Cameron definitely had a great time with one after Chris plucked it from the back deck. The highlight of Cam's week took place on two occasions, at the same place. 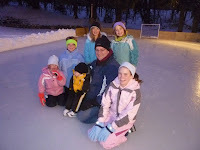 Our awesome neighbors across the street have created an immense ice rink in their backyard and have some perfect sledding hills to accompany the rink. After suffi ciently stuffing Cameron into his snowsuit, he was all ready to head next door. Our neighbor friends, the Raish's have a sled that fits Cam perfectly! He rode in the red sled by himself down a small hill and also accompanied Chris on a larger hill. He could definitley be heard laughing! 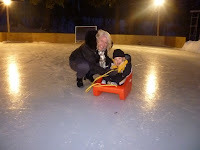 An unexpected treat was how fast we could pull Cam around the ice rink in the sled. So fast, that Jane couldn't keep even keep up with the boy racing around. 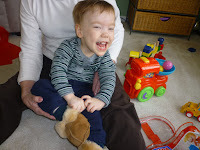 After all of that activity, it sure was fun to snuggle into some very comfy slippers that Cameron receiv ed from the Krauss family for Christmas. Chris and Jane will have to find themselves some of this cozy footwear!